This month's business meeting of ABC Business Network will take place on Thursday 31st Jan 2019 at Banbridge Enterprise Centre, Scarva Road Industrial Estate, Banbridge, BT32 3QD from 07:30 - 09:00am. Your Health is Your Wealth. As we begin another year, take some time to consider how your health and fitness impacts on your ability to do your job. We all need to maintain a healthy lifestyle to perform at our best in work and to deal with whatever challenges life throws at us. 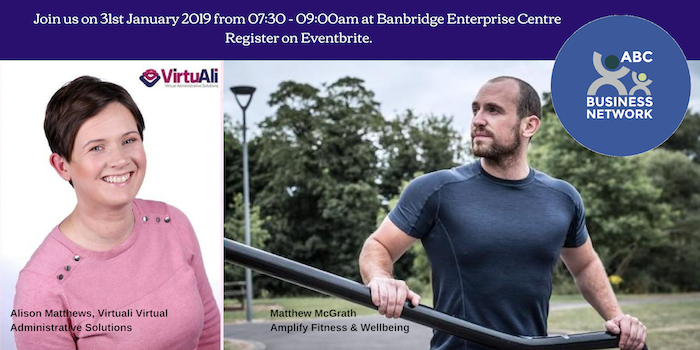 Matthew McGrath will give us an insight into his work as a Personal Trainer and challenge us to have the right mindset to be fulfilled in our personal and work lives in 2019. Matthew worked for Tesco for 15years before deciding that it was time to change his career path. He is and always has been interested in mindset, and the importance of looking after all aspects of living. He transitioned to become a personal trainer and loves helping people to just learn to look after themselves. He then began studying and learning more about mindset, completing courses through the Proctor and Gallagher institute in Canada. This led him to write his own course covering all of the things he felt that all other courses were missing. His 8 week guide "Unlocking your potential - The Process" takes each individual on their own journey of self discovery to ultimately discover that truly, anything is possible. All of his personal training sessions introduce snippets of the course along the way too. 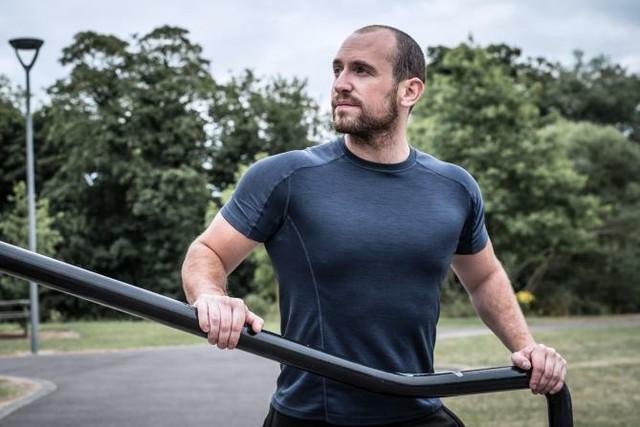 Matthew plans to build his brand, "Amplify Fitness and Wellbeing" and help clients to truly understand all aspects of wellbeing, how much it can affect their life. This enables them to take control, amend their focus and improve their overall quality of life. VirtuAli is owned by Alison Matthews or Ali for short (hence the business name!). Alison graduated from Queens University, Belfast with a degree in Modern Languages (French/German) and later completed a Postgraduate Diploma in European Business Administration. Having worked for 9 years for European Investment Bank (EIB) in Luxembourg as a Senior PA & Project Administrator, she returned home to the village of Moira and launched her own business providing outsourced administrative services to busy professionals. Alison has excellent organisational and customer service skills and works on many different types of projects. She helps to organise events, streamline processes to increase productivity, organises travel plans, types the minutes at HR disciplinary and grievance case meetings…. and much more! Alison loves the variety of her roles and the opportunity to help people by bringing new ideas and her experience to the table. Her work makes businesses more efficient and allows busy executives to go home, enjoy their evenings and lead a healthier lifestyle, safe in the knowledge that their admin tasks are under control. 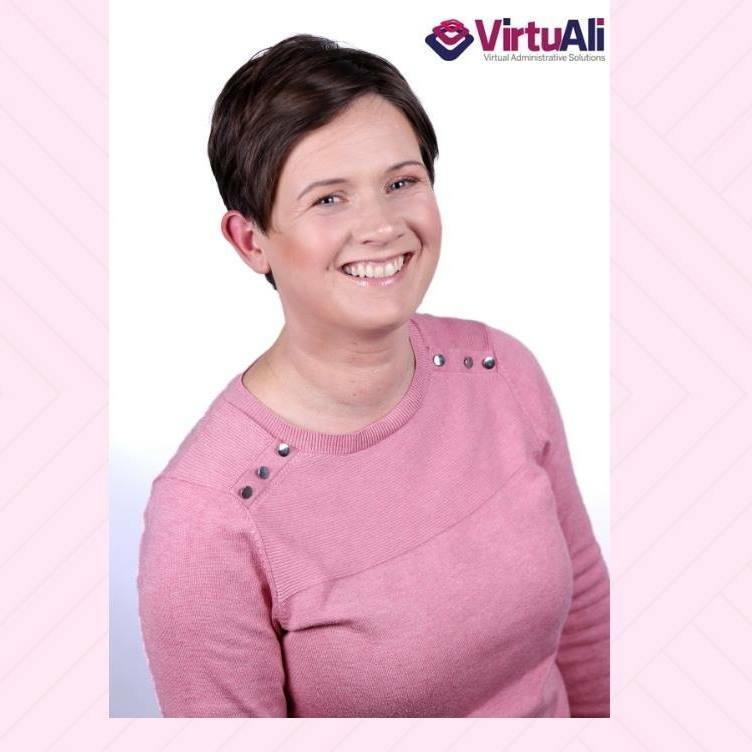 If you need someone to take away your admin pain, get in touch with Alison by email to alison@virtuali.uk or give her a call on 07796240677.